Two staples of Southern California are its top notch custom car scene and its abundance of sun-drenched females with golden hair. 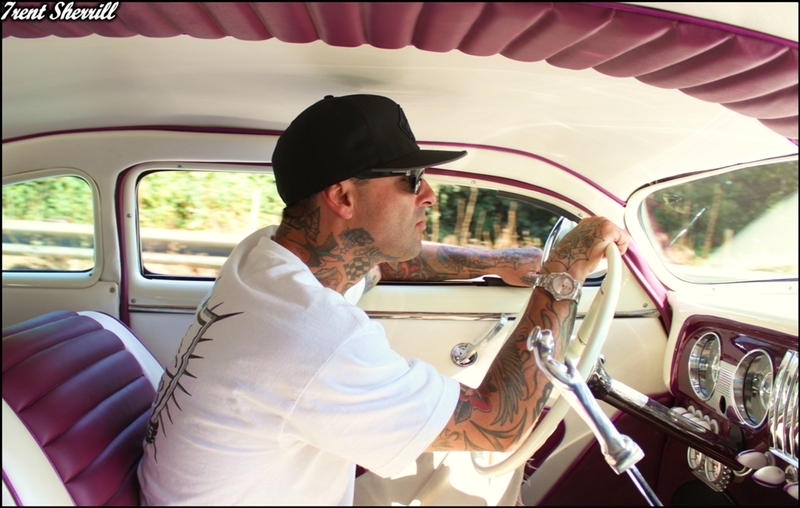 So what better way to showcase one of SoCal’s most recognizable custom Chevys, Ian Berky’s Minor Threat, than with quintessential SoCal Beauty Tara Studinger. The Chevy was a Christmas gift from Ian’s wife, proof that yes, there are still good ones out there to help fill the garage, not complain about whats in it. When she bought the car the roof had already been chopped, but Ian would soon learn the chop was a hack job and the work that lay ahead would have caused most to throw in the towel. Eventually coming to the realization the top just was not replaceable, Ian tracked down a few parts cars in Whittier and bought a complete ’49 Chevy top to replace the mangled iron on his ’51. With no shortage of metal work on his hands to put a new twist on an old classic, Ian enrolled in a metal working class hosted by none other than custom car legend Gene Winfield. 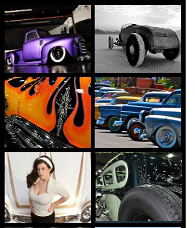 Not only would the knowledge prove vital on molding in the fenders, rounding the edges of the grill opening and fabricating a custom grille, but along the way he established a friendship with one of the culture’s originators. Since this was a radical build plan in the making, Ian made sure all the traditional modifications had been addressed; shaved handles, nosed front, decked rear, and frenched headlights before he would send the car half way across the country for some beauty tips. Eighteen months went by before the metal and bodywork was complete. Then Ian sent the rolling metal canvas to Premier Body & Paint in Arkansas City, Kansas. 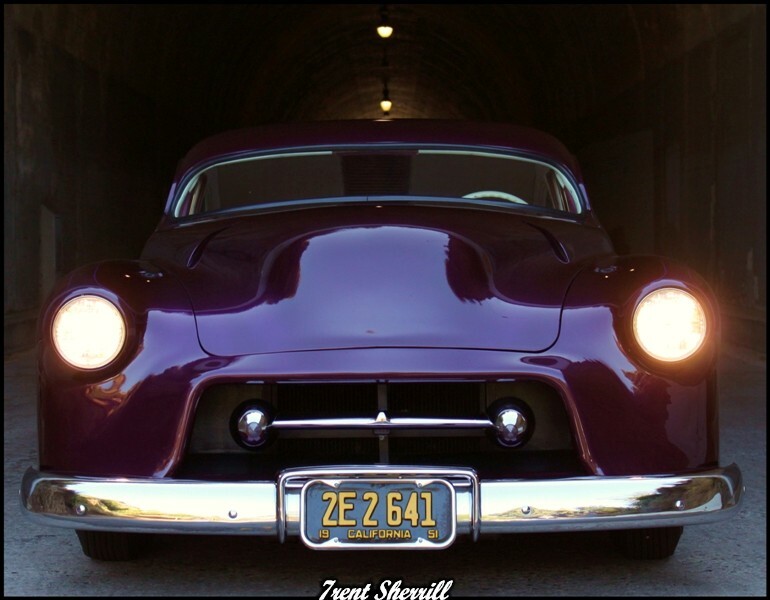 The plum color was mixed and shot by shop owner and Beatnik C.C. member Jeff Myers. If the name sounds familiar it’s because Jeff’s work has adorned some of the most award-winning customs of today. Look closely and you’ll catch a glimpse of the subtle, purple metal flake scallops running the length of the top of the front fenders. Then, you’ll truly recognize Jeff’s talent . 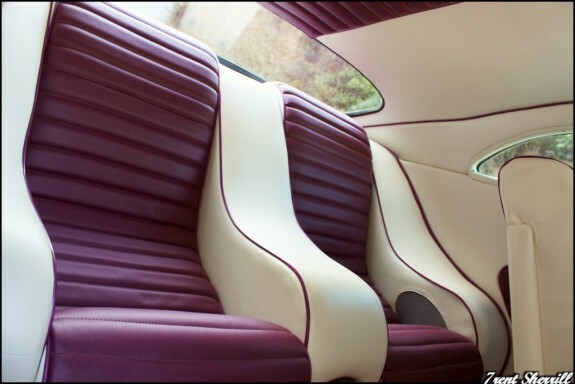 If you can take your eyes off Tara long enough… in the interior you’ll notice white and paint matched tuck and roll across the front bench and custom rear bucket seats. The theme carries across the headliner as well with purple piping trimming the seats and roofline. Under the hood a SBC dressed with finned valve covers, finned breather and chrome alternator keep the engine as aesthetically pleasing as the shapely exterior. 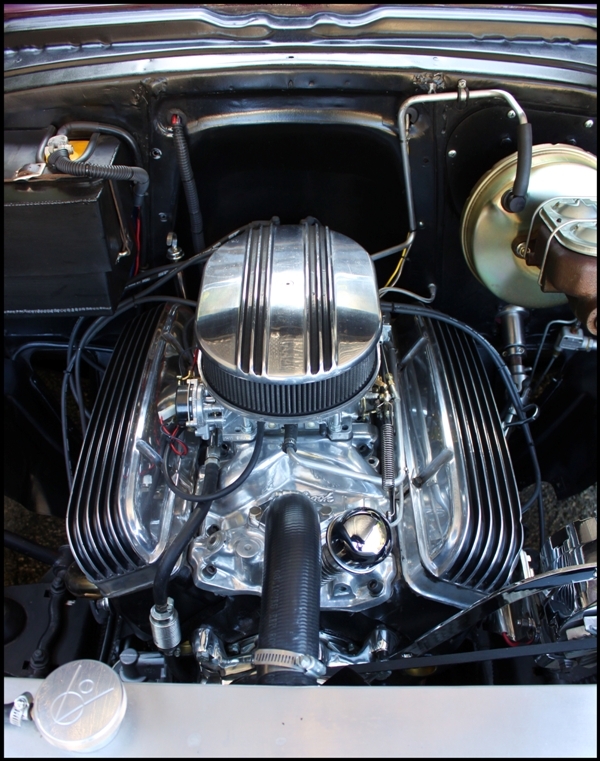 Performance enhancements such as an Edelbrock intake manifold and 4bbl carb dismiss any misconceptions that the 51 may be all show and no go. No shortcuts were taken with this build so why start in the engine bay? Since Ian’s plans for the Chevy never called for long trips strapped to a trailer, the suspension was upgraded with a Mustang II kit up front and Gambino taildraggers for the rear. A shortened 9 inch Ford rearend offers additional reliability for cruises or road trips and the wide whites (at least what you can see of them) tuck nicely into the front fender wells and are completely hidden out back when the skirts are on and the Chevy’s laid out. Since building the ’51, Ian’s had no shortage of requests from friends and new customers to apply his touch to their rides. After taking one look at Ian’s Chevy, can you blame them? I was fortunate enough to see Ian’s ‘51 first hand at Texas’ increasingly popular custom show the Lone Star Round Up back and April. It looked right at home next to several already famous customs from various Beatniks C.C. chapters; quite an accomplishment for a customizer that truly honed his skills during the build. Ian hails from Burbank, a city most famous for its movie studio lots where some of today’s most popular young stars can often be spotted. However, there’s an older one running the streets of Burbank now, 60 years old to be exact, that’s sure to steal the spotlight from any of them without ever saying a word. Love the car… Is it a 49 merc? OOPS! My bad, guess I should have read where it said 51 chevy. Really amazing car and really cool owner.I met him at this past Roundup2011 and even though he only knew me from online he was really humble and laid back.Very down to earth and approachable. Much respect to him and his work.After only seeing his car online it was definitively a treat to finally see it in person.The 2012 roundup (April 13th-15th) is right around the corner for those of you who have never been,you should attend it at least once.The show just keeps getting better and that’s no bs. 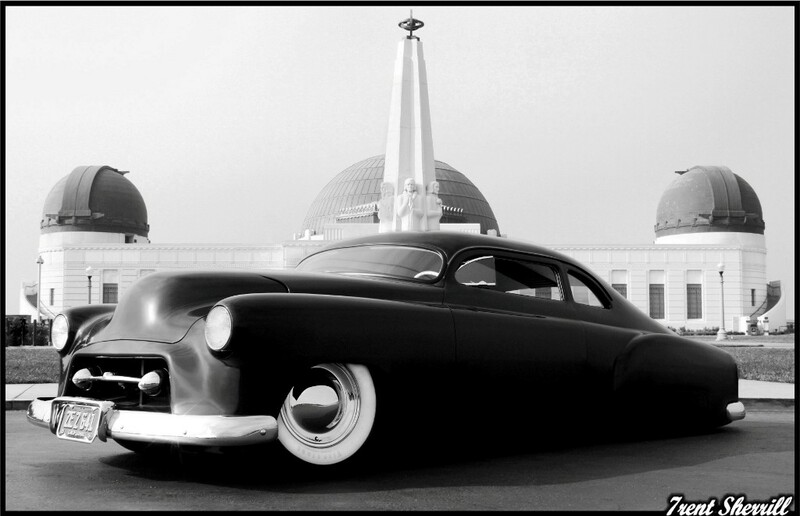 That is one righteous ride, I love the black and white taken at the Los Angeles Observatory, and you found the perfect model Ms. Tara Studinger whose beauty and curves accentuate the lines of your ride. I support all 49-54 Chevrolets and yours my friend is exceptional.